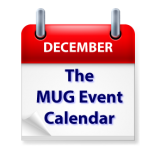 This week’s MUG Event Calendar is filled with not only great presentations, but also plenty of holiday cheer. Bob “Dr. Mac” LeVitus will speak to a Texas group, Time Machine is on the agenda at an Oregon group, and holiday parties will be held at groups from New Jersey to Illinois, the Carolinas to Florida, Ohio to Michigan.